Whether you live in a state which has current laws or pending legislation regarding the necessity of an emergency phone near your outdoor pool or you live in an unregulated state, there is no denying that an emergency pool phone is essential for the safety and well-being of everyone who uses it. This is especially true if your pool is used by children, but also true for adults who might be drinking and partying at the pool. It doesn't take long for a minor accident to turn into a major tragedy which could have been averted or minimized by the presence of an emergency pool phone. Precious minutes can be saved by having an emergency pool phone set up within easy reach of the pool. Hands-free operation allows for easy communications with the emergency operators while you wait for the emergency medical personnel to arrive. By being able to talk and listen on your emergency pool phone without holding a handset, you are free to follow important life-saving instructions that can mean the difference between tragedy and a scare. Emergency pool phones can be ordered for private pools, public pools, large or small pool areas and can have either a handset or push-button service with a speaker feature to maximize ease of use of the emergency pool phone. Everything you need for your emergency pool phone can be found here, from the phones themselves to cables, brackets and weatherproof cables. 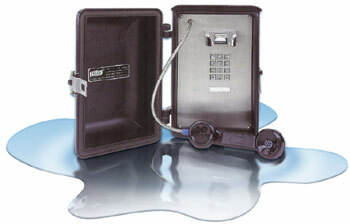 Mount your emergency pool phone on a chain-link fence or wooden fence or other enclosure. Use the push-button feature to call for help in the event of an emergency event in your pool. Having an emergency pool phone that can withstand all kinds of weather will provide you and your family the security of knowing that you are ready for any eventuality. No one wants to imagine the worst happening, but being prepared for the events we fear the most often means preventing the worst from occurring. An emergency pool phone isn't just for drowning but for any emergency situation that can happen around a pool. Study your pool area and decide on the best place for your emergency pool phone before you purchase the phone and its attendant wiring and mounting hardware. This preparation will help you decide how much wire you need, what sort of mounting box and even what type of emergency pool phone you will be installing. Consider the weather, not only during the summer months when the pool is used most, but also the winter months to help you decide what type of protective box you will be setting up to keep your emergency pool phone out of inclement conditions. Finally, all you have to do is connect your home phone line to your outdoor jack, set up your emergency pool phone and mount it near the pool and then settle back and enjoy your pool, knowing you are doing your very best to keep your family safe with your new emergency pool phone.